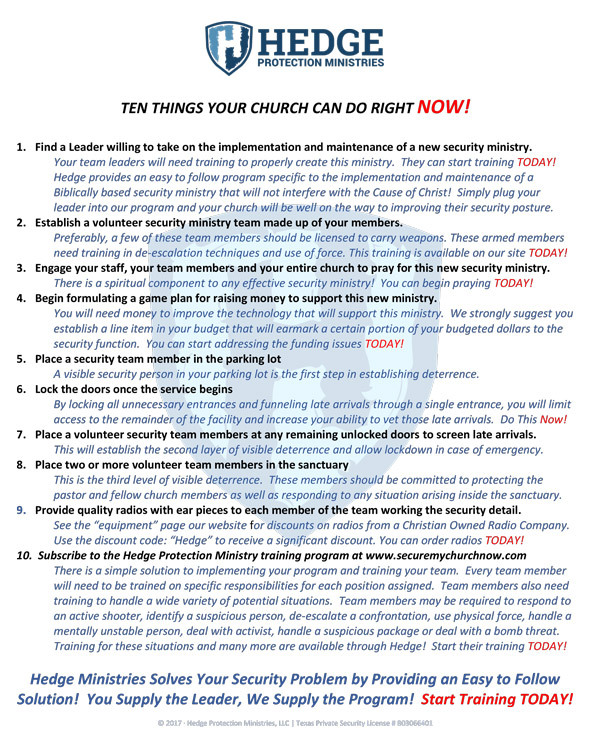 Here at Hedge, we wanted to make it as simple and affordable for any church to set up an effective security ministry. Our subscription pricing is tiered based on the size of your congregation and specifically the number of personnel on your security team that will need access to training. There is an initial $295 Set Up Fee which gives you total access to our entire video library for a single user for up to 30 days. There is an iron clad 100% money back guarantee that if you are not satisfied with our service, simply notify us within the first 10 days of purchase and we will immediately return the full purchase price. There is a scholarship program available to assist church plants and indigent churches with limited resources. Simply email us at info@hedgeministries.org and we will gladly work with you to address your individual situation. The subscription program will give individual members of your security team 24/7 access to our entire training video library for as long as your church remains a subscriber. This is for smaller churches with an average attendance under 150 with up to 25 members in your security team. Medium-sized church with an average attendance of 150 to 500 with up to 50 members in your security team. Large church with an average attendance of 501-1000 with up to 100 members in your security team. Extra-Large Church with an average attendance of 1001-4000 with up to 150 members in your security team. Megachurch with an average attendance of over 4000 with up to 250 members in your security team. Please note: Due to unprecedented demand, we were forced to do a major upgrade to our website. Please take a moment to report any issues you experience. Thank you.